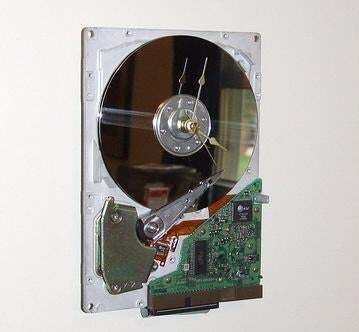 Usually when I come across a spare hard drive I think, cool, more storage space for my "video collection," but who needs more memory when you can turn that spare HDD into a wall-mountable clock. The creator of this clock claims all you need is a power drill, a clock movement, and about an hour or so of time. I gotta admit, it does look pretty cool hanging from the wall, but for the rest of us there's always the alternative.